What is Buckeye in the Garden? ...and the list goes on. 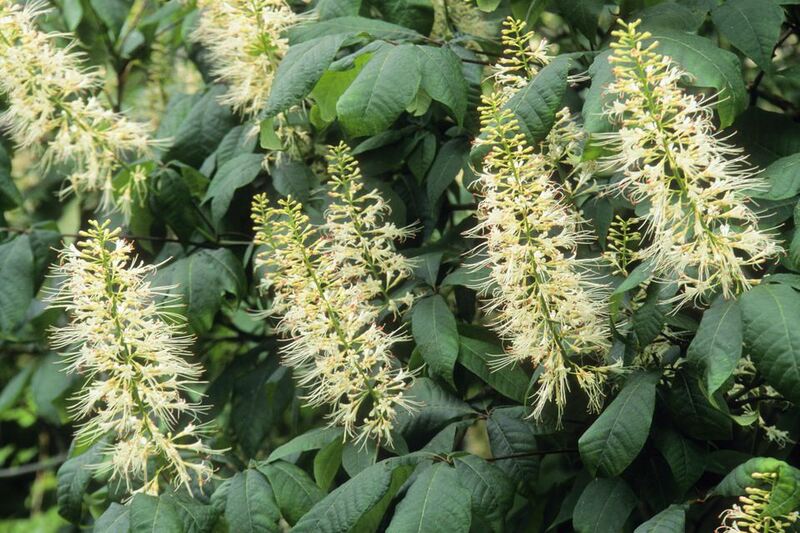 Since this is the Trees and Shrubs website, the question is best answered by focusing on the Aesculus genus for this article. What is a Buckeye Tree or Shrub? Members of the genus Aesculus may be called either buckeyes or horse chestnuts depending on the area they come from. Horse chestnuts are from Europe and Asia. Buckeyes are from North America. These trees and shrubs feature opposite branching (the Horse in the mnemonic MADCap Horse, which is meant to help you remember which types of plants have this feature, refers to the Horse chestnut genus). This feature only appears in a few kinds of trees and shrubs so this can definitely help you identify these plants. Depending on the species, there will be 5 to 9 leaflets found on each of on the palmately compound leaves. The flowers are tubular in shape and grow in an upright, large, loose pyramidal cluster called a panicle. They can be white, red, or yellow. Although horse chestnut has the word "nut" in its name, the fruit produced is actually a capsule. The appearance will vary by species, with some having spines and warts while others are smooth. They are not edible and should not be confused with the true chestnuts, which are in the Castanea genus. In fact, they are poisonous and thought should be taken in selecting if you have young children or pets around. The name for horse chestnut trees and fruits in the United Kingdom is "conkers". Children there use the fruits to play a game by the same name.